EN · silverfish, fishmoths, firebrats DE · Fischchen PL · rybiki RU · щетинохво́стки, чешуйницы Silverfish are so called due to the silvery glitter of the scales covering their bodies. Their movement is "fish-like" and makes it look as if they're swimming. The other name bristletails because of their three long caudal filaments. They are less than 1 cm long and found in damp corners or amongst books and paper in houses. Silverfish feed on cereals, paste, paper, starch in clothes, rayon fabrics and dried meats. 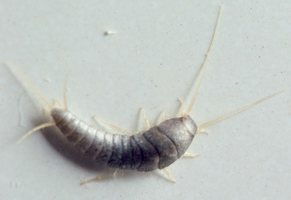 Silverfish can sometimes be found in bathtubs or sinks at night, as they have difficulty moving on smooth surfaces and so become trapped.